← What do you have in the first aid section? 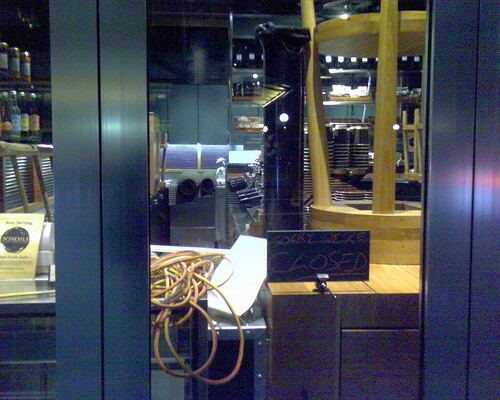 Sign inside coffee shop on the George St side of The Galleries Victoria (TGV) reads “Sorry we’re closed”. Though at 1/4 past midnight, I’m not really looking for coffee, just sleep. I liked the contrast between light and shadow, black and shiny, and the polite little sign. This entry was posted in Photos and tagged night, photo. Bookmark the permalink.